Hold Everything is a 1930 American Pre-Code film. It was the first musical comedy film to be released that was photographed entirely in early two-color Technicolor. It was adapted from the DeSylva-Brown-Henderson Broadway musical of the same name that had served as a vehicle for Bert Lahr and starred Winnie Lightner and Joe E. Brown as the comedy duo. The romantic subplot was played by Georges Carpentier and Sally O'Neil. Only three songs from the stage show remained: "You're the Cream in My Coffee", "To Know You Is To Love You", and "Don't Hold Everything". New songs were written for the film by Al Dubin and Joe Burke, including one that became a hit in 1930: "When The Little Red Roses Get The Blues For You". The songs in the film were played by Abe Lyman and his orchestra. Brown plays Gink Schiner, a third-rate fighter who is at the same training camp as Georges La Verne (played by Georges Carpentier), a contender for the heavyweight championship. Although he needs to be concentrating all of his energies on the upcoming bout, Georges keeps getting distracted: Norine Lloyd, a society dame, has a distinct interest in him, but the interest is strictly one-sided. Georges prefers Sue, an old buddy and confidante. 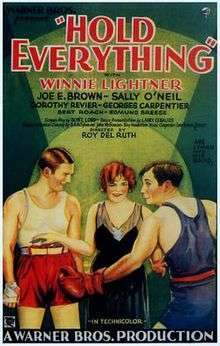 Gink has woman trouble of his own, as his flirtations do not sit at all well with Toots (played by Winnie Lightner), his erstwhile girlfriend. More trouble arrives when Larkin, manager of current heavyweight champ Bob Morgan, appears at the camp with the goal of fixing the fight. He is sent packing, after which he attempts to slip a Mickey Finn to the challenger—a plan which goes awry when Gink switches the drinks. Meanwhile, Gink, who is fighting in a preliminary in advance of the big fight, actually wins. Things don't look so bright for Georges, who initially gets the worst of it in his encounter with Morgan, but who eventually comes out on top. In 1930, this was the first film shown at the newly opened Warner Bros. Hollywood Theatre, a luxurious New York City movie palace specifically designed to showcase its then-revolutionary Vitaphone sound films. The theatre later became a legitimate Broadway venue, the Mark Hellinger Theatre, and is now the home of the Times Square Church. While the soundtrack to the film, recorded on Vitaphone disks, still survives, all film elements have been lost. ↑ Morrison, William (1999). Broadway Theatres: History and Architecture (trade paperback). Dover Books on Architecture. Mineola, New York: Dover Publications. pp. 162–163. ISBN 0-486-40244-4.